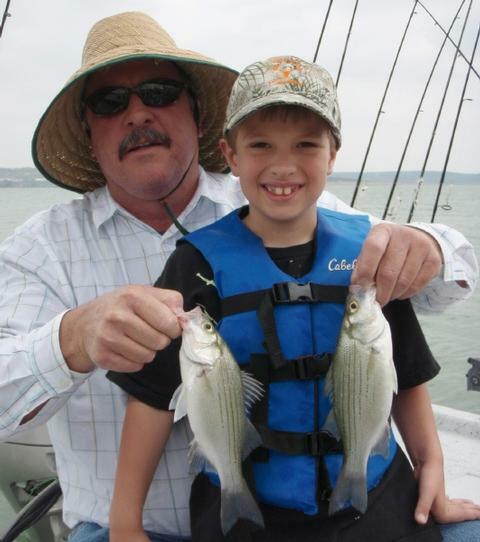 For his third consecutive birthday, Garrett G. of the Austin area, accompanied by his dad, Thom, and his younger brother, Carson, once again joined me for a big birthday fishing excursion. Garrett with our first and largest white bass of the trip, a nice 14 5/8 inch fish taken on a flatlined Reef Runner Rip Shad. 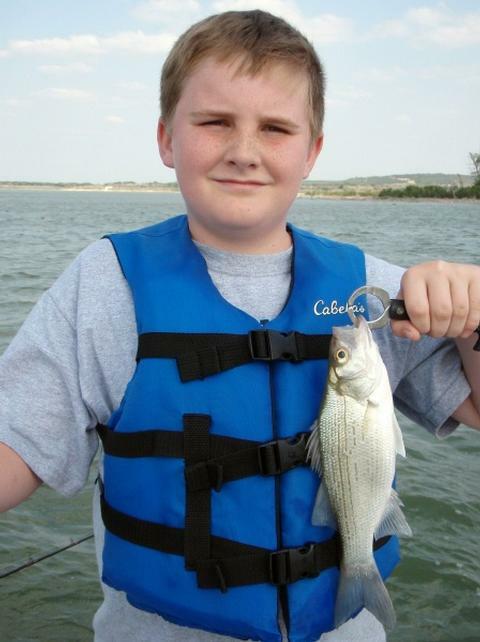 Carson was our multi-species expert today landing sunfish, largemouth, crappie and white bass. That’s his dad, Thom, getting his thumbs slimy. This year, Garrett (7 years old) invited his buddy from school, John M. (also 7 years old), and John’s dad, Jim, to come along. Garrett and Carson arrived a bit earlier than John, so, we dabbled around for sunfish in the shallows using maggots and slipbobbers. The boys landed 3 small bluegill which I placed in the livewell for entertainment purposes in case we experienced a lull in the action. Once our party was assembled, we headed out to look for a repeat of yesterday’s topwater action, but, we either got there too late, or it never occurred, but, no fish were to be seen in the overcast, choppy conditions this morning. We gave downrigging a try, but only found suspended bait and not much in the way of suspended gamefish, so, with the conditions still fairly dark and a steady wind, we headed shallow and flatline trolled Rip Shads off of Area 116 and Area 999. Area 116 produced 1 largemouth and 2 white bass, including our largest of the trip, a 14 5/8 inch fish. Area 999 produced 1 white bass, 1 crappie, and 1 largemouth. We had a number of fish come unbuttoned before we landed them, as well. By around 9:30, the skies were getting a bit brighter (to the threshold of marginal) and the wind was right. The boys were a bit antsy and I really wanted to get them on a deepwater bite so they could constantly have their hands and attention occupied. We looked at a number of areas with sonar and finally found a “fishable” population of fish at Area 033/768. I got set up over the fish, gave the boys clear instructions on the “smoking” technique they needed to use and we gave things a try here. 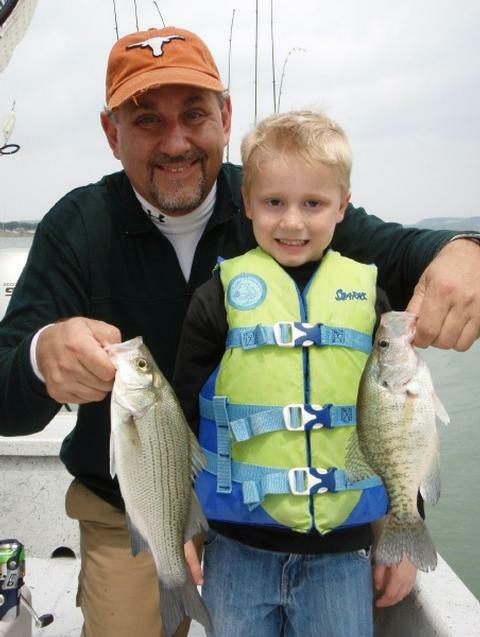 The “window” of a good feed was just barely beginning to open here, and we enjoyed limited success, putting 9 white bass in the boat right away, but they soon settled right down to the point where only technical jigging (beyond the boys’ ability) would have worked. We moved on. Next, we hit Area 450. The “window” was now opening wider as the skies grew markedly brighter in a short span of time and as the wind’s velocity began to suddenly increase. We set up over these fish and, using a smoking tactic, boated 24 white bass. The situation I saw on sonar was not a “carpeted bottom” where fish were thick in all directions, so, as soon as the bite here slowed, we stayed local and looked elsewhere in this immediate vicinity for additional fish. We found fish at Area 757/761, and stayed on these fish for the duration of the trip. We boated a total of 69 fish here including 65 white bass in the 2, 3, and 4 year old class, as well as 2 short largemouth bass and 2 freshwater drum. All around the same time as the clock ticked towards noon, the fish action began to wane, the boys’ attentions span began to dwindle, and pressing plans for a 1:30 baseball game in Austin began to call. So, we called it a very good trip right there and headed back to the dock. Thom and I looked knowingly at one another at the successful completion of the trip and agreed that an afternoon nap was in order for both of us!! 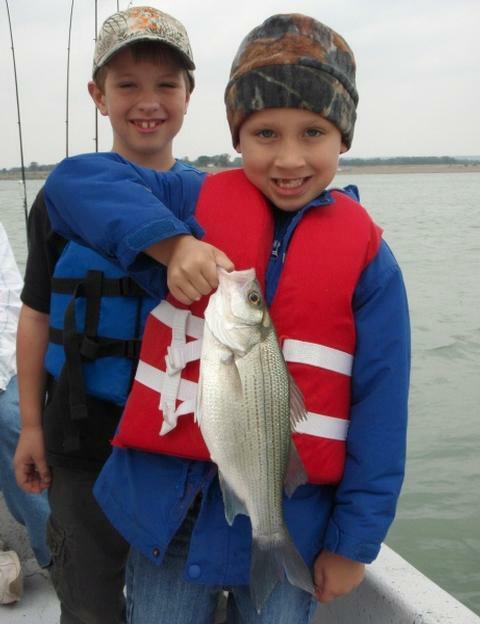 The key to fishing with very young kids is keeping them constantly engaged. My options right now are a bit limited due to a lack of sunfish in the shallows just yet, so, we changed up techniques, moved regularly, had snacks, answered questions, looked at the fish in the livewell (approximately 14,083 times!) and did the best we could with the conditions we had. Thom and Jim noted that I keep a “counter” on my beltloop for keeping an accurate tally of our fish. They jokingly mentioned that I need to wear a second version for counting the boys’ laps around the center console as they explored their new, floating environment! Wind: Winds were S10-12 until around 10:30 when the ramped up suddenly to S16. Skies: Skies were completely overcast and murky until the time of the wind increase when the murkiness cleared and gave way to much brighter, hazy conditions. I took a down day today and fished solo to do an exploratory trip to the lower end of Stillhouse today. Typically the end of April/beginning of May brings a time of transition to deeper water, the formation of a thermocline, and as a result, the fish tend to suspend more and remain deeper, on average, than during the preceding 2 months or so. This is a crop of a Lowrance HDS-10 screenshot of the last area (Area 775) I fished today. The red mass overlying the brown bottom is a densely packed school of white bass literally carpeting the bottom. The black and white StructureScan image confirms this with greater detail. 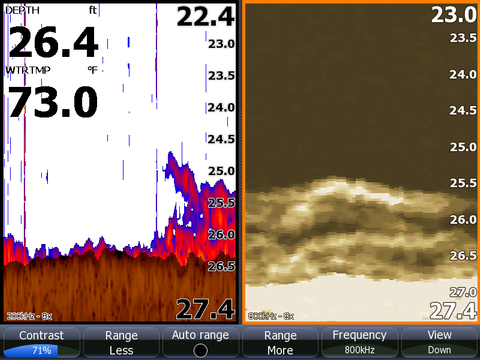 This is a Lowrance HDS-10 screenshot of the same area above, zoomed in to the maximum extent on both colored sonar and on black and white SturctureScan. The key here is “target separation” which is the sonar’s ability to distinguish between targets that are very close to one another and avoid “lumping” them as if they were a single target. Due to the configuration of the StructureScan’s sound pattern, it excels at target separation and image clarity. Note 4 distinct grey “arches” showing 4 separate fish very close together on the black and white display. I did my homework last night by going back over a number of years’ worth of my own blog entries and recalling the Area numbers where I’d found fish under similar circumstances in this season over the years’ past. I made a “hit list” of areas to check out on sonar as a starting point for this morning’s trip. This morning I launched and began simply observing — observing sonar, the water’s surface, bird life, for the odor of fish over the water’s surface — anything that would point to fish, be it gamefish or the bait they require to feed upon. Before long, I caught sight of an osprey acting “fishy”. I cut the engine and drifted from a distance away and watched as it made 3 attempted dives toward the water’s surface, but pulled up short each time. That meant schooling fish! I quickly got to the area of the action between Area 177 and the shore to the S. of it, cut the outboard, dropped the trolling motor and moved in for a look with rod in hand. I found very aggressive white bass in schools of 25-50 fish per school feeding at and near the surface on shad approximately 1.5 inches long. There was much more going on beneath the surface than on it. I geared up with a Cork Rig and quickly realized these fish were willing to hit a much larger offering than that as they struck at the cork instead of the teaser behind it!! I switched over to a Spook and stuck with it until the action left the surface, at which time I switched over to a silver/silver Reefrunner Cicada. In the first 70 minutes of light I caught 51 fish (exactly 50 whites and 1 largemouth), and left these fish while they were still biting to seek out other shallow fish while the action was on. This bite cooled off a bit as the sun rose but the winds stayed calm. In fact, I never saw another gamefish break water all morning following this sunrise blitz. I waited through a bit of a lull until around 9:10 when a stiff S. breeze began at 9mph, then steadily ramped up to 20mph by 12:30pm and leveled off at that high velocity. As soon as that wind kicked in the fish put on the feed bag. This action was no doubt enhanced by a poor feed yesterday with its light N to NNE breeze, bright skies and near calm conditions. Area 775 – 14 white bass caught, the first 7 came easy, then I had to jig for the last 7 and knew I’d seen the best of it by now — packed it up and headed home for lunch. In all, I boated 109 fish today and came away with confidence in knowing where the fish are for the sake of getting clients on top of fish over at least the next 2 weeks or so. TALLY = 109 FISH, all caught and released. Wind: SSE4 at sunrise and staying that way until just after 9am, then turning due S. and going immediately to 9, steadily climbing to 20mph by noon. Skies: Bright, clear, and dry. 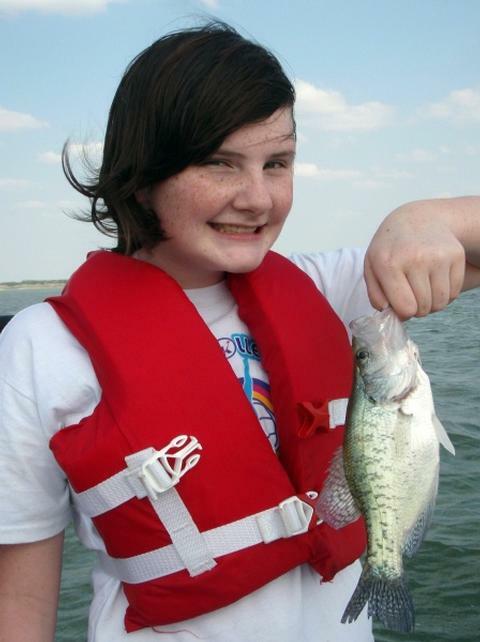 I fished a “Kids Fish, Too!” trip today with a family who preferred not to be identified. Area 766 – 4 white bass, 1 largemouth, 1 bluegill via jigging with TNT 180’s in 3/8 oz. Area 769 – 30 white bass via smoking TNT 180’s in 3/8 oz. The children had played out by around 11:30, our traditional 4-hour end time for children’s trips, but, the wind and sun conditions indicated more fish could still be caught. I headed back out after our trip concluded and tried one more area we hadn’t gotten to today, Area 770. I fished there just briefly and attempted to land 10 whites, which I did, before heading out to look at other potential fish holding areas. The bite was about over by now, however (noonish) and after failing to graph fish on several more areas, I packed it in. Wind: SSE9 at ~160 degrees, slowly increasing to SSE16 from the same direction by the trip’s end. This evening’s trip was the eighth S.K.I.F.F. trip I’ve run for 2011. This evening’s trip was literally a postponement of a postponement on account of weather, and we still didn’t get the weather we’d hoped for after waiting for over 2 weeks for a good window. Nonetheless, I welcomed aboard the Narciza brothers, Nathaniel (8th grade) and Shawn (6th grade). With each boy packing a single bottle of water and a tightly wrapped Subway 6 inch sub with extra onions and pickles, they were loaded for bear!! The boys’ dad, Staff Sergeant Michael Morales, is deployed with the 2-82 Field Artillery, supporting the 1st Cavalry Division. The boys’ mom, Cheryll, opted to stay on shore with her 2 year old daughter. 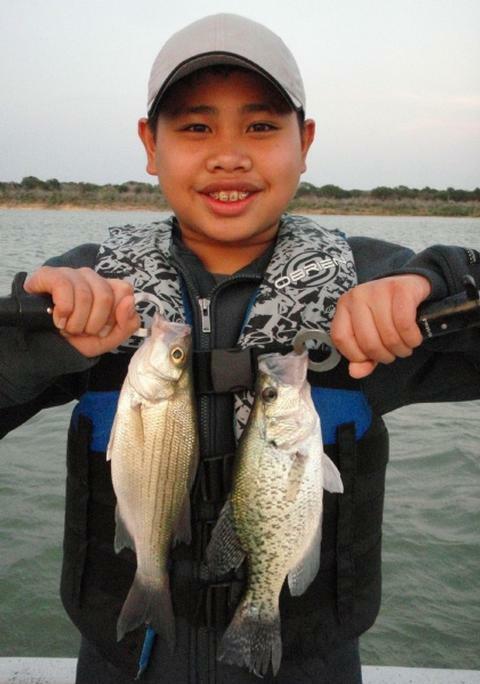 Shawn Narciza, age 12, with his largest white bass of the evening and a bonus crappie. 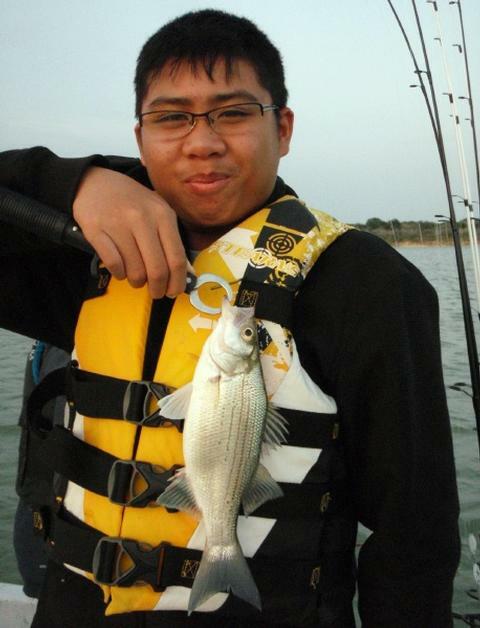 Nathaniel Narciza, age 14, with a 2008 year class white bass he landed on a Sandblaster. After pushing their 9 April trip back (26 mph winds) and after pushing their 23 April trip back (22 mph winds), as we launched, we were still hounded by winds at 18-19 mph and from the SSE instead of S, but decided to make a go of it instead of letting the boys down again, and because the winds were to taper to 11 mph by 7pm (which didn’t even come close to happening). Well, we took lemons and made some lemonade, albeit not by the 5 gallon jugful!! A few areas I’d hoped to fish were just inaccessible due to the heavy waves, and when we did find fish, they were less than enthusiastic about hopping on our slabs. It’s funny how the presence of the easterly component to the wind impacts fish activity. We found white bass stacked up down on bottom in 24 feet of water. Normally, with favorable winds (S, SW, or W) as you drop a slab down amongst them, they’ll just pounce on it, and schoolmates will followed a hooked fish toward the surface thus exciting the rest of the school, and the activity level will stay high for as much as 45 minutes or more. Under conditions like we had tonight, there were many fish there as verified by sonar, but, when that slab reached bottom, it went unnoticed and had to be finessed to get a response. A hooked fish may or may not create interest from the rest of the school, and, if it does, it is only short lived. 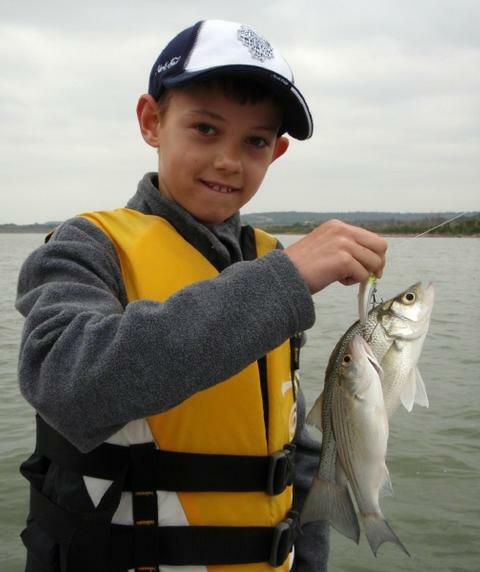 Anyway, the boys boated 15 fish (all white bass) in about an hour’s time using both TNT 180 slabs and Sandblasters over a fairly sluggish school of fish we found at Area 767. After these fish turned inactive, we searched a number of areas where I could maintain boat control, but we found no congregations of fish showing on these areas. We changed up our approach and headed over to Area 116 and put out twin flatlines, one with a Wiggle Wart, the other with a Reef Runner Rip Shad, and, over about a 40 minute span boated 3 more fish, including 2 white bass and a crappie, by trolling in 8-14 feet of water. Prior to this evening’s trip, the boys had dabbled in West Coast saltwater fishing from shore with their grandpa, near San Diego. Shawn had never even been aboard a boat before, so, the whole experience was a very enjoyable one for them and for me. Skies: Skies were completely overcast but bright. This morning I welcomed best friends Janviere (nickname “J” ) and Alissa aboard in celebration of J’s 10th birthday coming up on April 28th! J’s mom, Suzanne, and her step-dad, John, chaperoned. Cute girls, cute fish!! 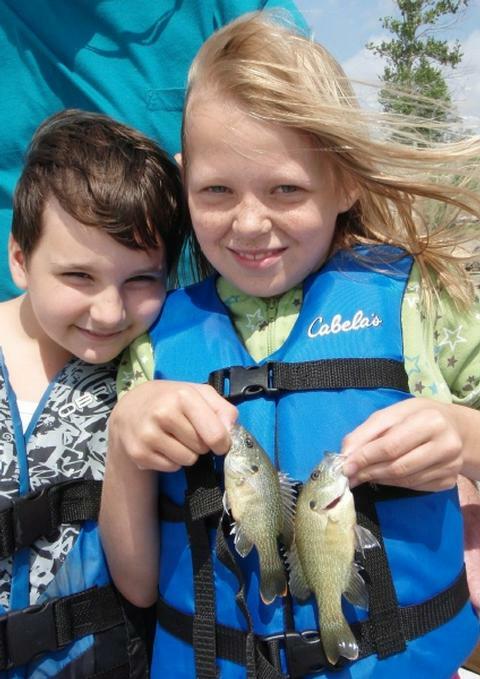 Janviere (L) and Alissa (R) went fishing for J’s 10th Birthday!! “J”, ably assisted by John, got the hang of jigging early and kept her technique consistent — and it paid off!! Alissa, who showed no fear at gripping fish, handling hooks, baiting up with maggots, or anything else, got to be J’s special birthday guest today. In order to keep this whole thing under wraps until their actual arrival at the boat ramp, the “story” was that Salado had a new professional baseball team (the Salado Hitters, I believe) and that the family was going to watch them play the Rangers in Salado. Crowds were sure to form early, so an early wakeup and drive to the destination was necessary. So, both J and Alissa were a bit taken aback when they learned they were actually going on a fishing trip this morning. As we got started, we tried some flatline trolling in the vicinity of Area 999, but zeroed there. We did finally contact bait and fish in the vicinity of Area 116 and made multiple passes resulting in boating our first couple of fish of the morning — 2 white bass and 1 short largemouth. Once the skies brightened a bit through the clouds and the wind began to push adequately, we moved out to open water and searched for congregations of fish. We were successful in locating some reluctant, bottom-hugging white bass at Area 766 in about 22-24 feet of water. These fish were just beginning to turn on and never really got frenzied to the point of responding to a smoking retrieve. Instead, we had to jig for these fish, so, I set the girls up with braided line to make bite detection simple and they did the rest. In about 1 hour and 45 minutes spent here, we boated 43 fish including 41 white bass, 1 sunfish, and 1 short largemouth bass. By 10:45 the action here was beginning to wane and the girls both had hurting wrists and fingers. I explained that our options for the remainder of our trip were to continue jigging for white bass elsewhere or to give sunfishing a try. The variety of sunfishing appealed to both girls, so, we broke out the panfish gear, headed shallow, and, long story short, boated 6 sunfish (2 longears and 4 greens) in about 30 minutes’ time at Area 456. With the sunfish thinning out, the wind now at 20mph, and the clock telling us it was beyond 11:30, we decided to call it a great day right there and headed for shore. Wind: Winds were S11-12 at trip’s start, steadily increasing to S20 by trip’s end. Skies: Skies were completely overcast at trip’s start, steadily decreasing to 50% cloudy on a fair sky by trip’s end. This evening’s trip was the seventh S.K.I.F.F. trip of 2011. This evening the wife and children of Chief Warrant Officer (CW3) Harley Sanford came aboard for an after-school treat. CW3 Sanford is an Apache helicopter pilot serving in Iraq with the 1/229 Aviation. Little brother, Trey, got first fish honors by virtue of his age. He tagged this white bass just minutes into our trip as we flatline trolled off of a shallow point. Vinessa smiles sheepishly about her crappie also taken in the first minutes of the trip, and right where Trey’s white bass came from. Big brother Taylor then kicked in with a largemouth that fell for his crankbait, still within the first 15 minutes of our outing, and from the same spot (literally within feet) of where Trey’s white bass and Vinessa’s crappie came from. Mrs. Gina Sanford, her eldest son, Taylor, her middle daughter, Vinessa, and her youngest child, Trey, had all been fishing before and mentioned that fishing and camping was actually one of the things they missed most while dad is away. All of the Sanford kids’ fishing experiences up to today had been shore-bound, so, not only was the fishing very fun, but just the experience of “going fast” in a boat brought shrieks of excitement (even though my “baby” only goes about 30 knots wide-open). We launched around 4:45 and, literally, each child had boated their first fish within the first 15 minutes on the water!! What a great start! We found a mixed bag of fish up on a shallow point actively feeding on shad. The fish were shallow due to the turbid water, grey cloud cover, and strong wind, all working to cut the direct sunlight beating down into the normally clear waters of Stillhouse Lake. We went with a flatline trolling approach at first to keep it simple, and went in age order, youngest to oldest, taking turns on the two rods I had set out so everyone caught the same number of fish. We wound up catching a total of 8 fish here at Area 764 by way of flatline trolling with Rip Shad 200’s, and then moved out to deeper, more open water when the wind backed off a bit to 13-14 mph. We looked over several areas, finding the most active fish at Area 765, a mid-lake shoal topping out at around 24-25 feet. As they often are, the most active fish were found at the shallowest point on this structure, so, we hovered over top of these fish and worked our slabs (TNT180’s in 3/8 oz. white) in a “smoking” technique over top of these fish we initially found on sonar. In about 70 minutes’ time the kids boated 27 fish here, including one largemouth bass and 26 white bass, all falling right at 11.75 to 12.75 inches in length. As the setting sun fell behind a thick grey cloud bank in the west, the fishing went soft a little earlier than usual, at around 7:30pm. We went looking elsewhere in deepwater, and then tried flatline trolling in two other areas, but to no avail. We ended the trip around 8:20 as day turned to night with a total of 35 fish landed for our efforts this afternoon. With the water now in the low 70’s, the weather consistently warm, and the sunfish beginning to permanently inhabit the shallows, I’ll be able to conduct more trips for the younger (2nd grade and below) children waiting for a SKIFF trip … so stay tuned for more frequent reports. Thank you for what you’ve done to make trips like this, and memories like this, come to be for the kids of our soldiers! Skies: We were heavily overcast to the point of drizzle this morning until ~10a, then the cover slowly tapered to 20% on fair skies the balance of the day. 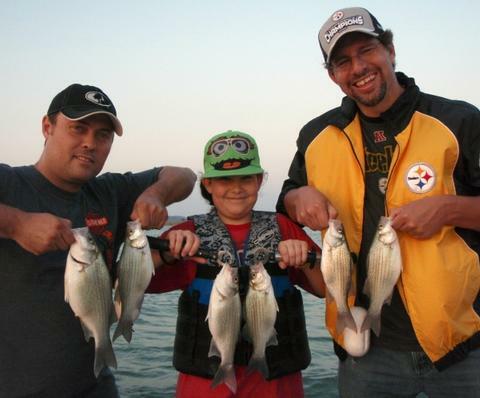 This morning I ran a white bass fishing trip for returning guests Richard H. and his son, Alec. Joining the pair were father and son, Mark and Thomas, on “holiday” from the Manchester region of England. Only the two boys (Alec and Thomas) were fishing as the dads had a bit of a reunion. 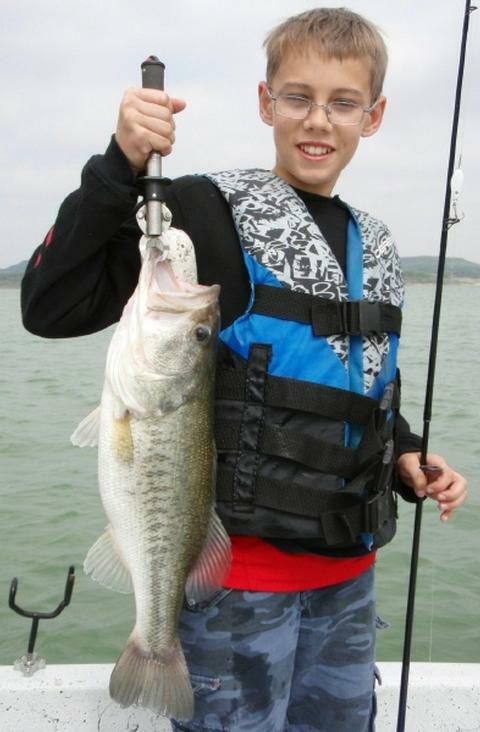 Alec fooled this 20 7/8 inch, 5.00 pound largemouth with his TNT 180 slab. This fish was “ghosting” a school of small white bass we’d located in 25 feet of water. The morning was warm, heavily overcast, and breezy with the S. wind at 12 before sunrise. Since Thomas had never been fishing before, we began very fundamentally by using a bream rod to catch small sunfish in shallow water (Area 456). We found a few green sunfish and bluegills here and managed to boat 8 which I held onto as live bait if the opportunity presented itself later in the trip. Next, we set out to find white bass. Looked over a few deeper areas and gave it a go at one of them, but really didn’t see anything on sonar to get excited about. Often on dark mornings like this one, the deeper bite doesn’t get going until the skies brighten a bit. So, we decided to look a bit shallower. As we searched around, I observed a blue heron dive multiple times over open water — a sure sign of schooling gamefish. We checked the action out and, in the heavy chop, could see small, briefly appearing schools of white bass feeding on shad on the surface. Since schooling fish in ~70F water tend to move quickly, we rigged up with a flatline trolling spread consisting of twin Reefrunner Rip Shad crankbaits and put them out at a set distance to keep them scuffing bottom from time to time. Over the next 90 minutes we boated 16 fish including 15 white bass and 1 largemouth. On our very first trolling pass, Thomas caught two fish on the same lure at the same time. By around 10am, the skies had brightened just a bit and the novelty was wearing off the trolling approach, we we again searched deep water for large schools of white bass. At Area 546 I graphed some white bass holding fairly well-spread over an ~80′ diameter piece of bottom. I got us over the center of mass and coached the boys to help them keep their “smoking” technique consistent. They immediately were into fish and stayed in them for about 50 minutes during which time we boated 24 more fish, including 23 white bass and an outsized largemouth (see photo and caption above). We did hang some bait here but the white bass were worrying the sunfish to death before largemouth could zero in on them. We had one white bass mouth the bait without getting hooked and drop off right as Alec was bringing it out of the water, and had another white bass swallow the bait right to the base of the bait’s tail, despite using a circle hook. Our last bit of success came between 11:25 and noon, right at Area 723. Again, I found white bass holding tightly to the bottom (thanks to StructureScan) and well-spread over a strip of bottom 70-90 feet long. The fish perked up quickly, but didn’t stay “jazzed” too long, as is typical towards midday. We worked in 18 more white bass here, all on TNT 180 slabs, before the bite went soft as the murk lifted and bright skies began to take over. And so ended our excursion today with a total of 66 fish to show for our efforts, not to mention two boys with very sore wrists! On our last trip in late November of 2010, Richard caused quite a stir in the birding world after sighting a black-legged kittiwake (a tern-like bird) feeding on shad at Belton Lake as we fished for white bass. It seems bird oddities follow Richard around as today the boatful of us witnessed a mid-air duel between an osprey and an adult bald eagle. At first the eagle was the aggressor, pestering the osprey and trying to get the fish it had in its talons away from it. After several moments, and at an altitude of perhaps 400 feet, the eagle was successfull in causing the osprey to drop the fish (either a gizzard shad or white bass of about 10 inches in length). We watched the fish fall for several seconds, and hit the water with a big splash. Next, the eagle moved in and snatched the floating fish off the surface and flew off to the west with its stolen prize. We then watched the osprey, just 10 minutes later, make another successful grab at a white bass from out of a surfacing school of small fish. This time the bird headed to the closest dead tree and downed its meal before any bald bullies could find him. This afternoon I was joined by Scott C. of Taylor, Texas. Scott has a neat “American dream” story — he came to America as a 5 year old, along with his family, from a Laotian refugee camp with the help of a local church in Oklahoma. 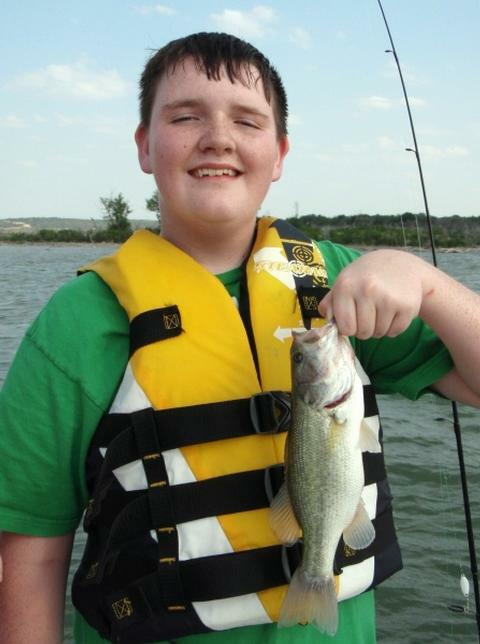 Fast forward to 2011 … he’s now married, has a son, works at Dell, attends church in Taylor, and loves to fish!! 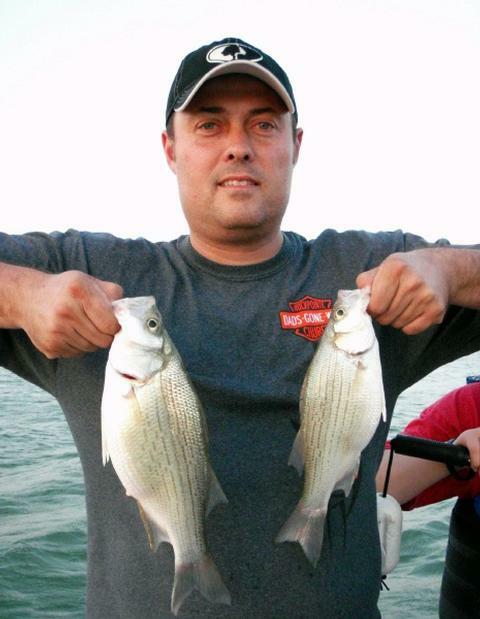 Scott with his two largest white bass of the evening. The largest went 14 1/8 inches and 1.50 pounds. Scott contacted me about a week and a half ago after his wife suggested he hire a guide to try to “put all the pieces together” when it came to fishing. He’s got a boat with sonar, his own equipment, etc. but is a hands-on learner and wanted a hands-on trip to try to get over a few obstacles he’s encountered on his way to fishing success. I was VERY concerned about our weather today and, in fact, pushed our trip back from the original morning start time into the afternoon based on the wind forecast. This morning was supposed to have calm to light northerly winds (and we did), whereas this afternoon’s forecast was for stronger ESE winds. We did wind up with ESE winds at 5-8 and that was a sufficient improvement over the extended period (nearly 36 hours) of winds from the due north to turn the fish on. Scott’s willingness to flex on the trip time made all the difference in the world. My experience this past Thursday told me the fish were turning on around 5pm-ish, so, we spent a bit of time throwing soft plastics for largemouth bass until the time was right (and never got a touch on either of our lines). By 5:10, we left that alone and headed out in search of white bass. We were blessed to encounter heavily congregated fish near bottom at the very first place I chose to look … Area 702. It was very straightforward fishing here … we buoyed, stayed on top of these fish, jigged a while to get the fish turned on, then smoked them for all they were worth while they were close in to the boat, then followed that up with a blasting technique afterwards. We spent the remainder of our trip right here on this one area, boating a total of 103 fish without moving more than 20 feet in any direction. During this 3 hour time we had an ongoing fishing conversation about the seasons, the weather, equipment, lure selection, sonar interpretation, transducer function, and the list goes on. I offered Scott some practical fish catching and fish fighting tips that he immediately put into practice and benefited from. All of these things were aimed at making Scott more confident and successful the next time he heads out on his own. The two pieces of advice that I really stressed to him, as I do all my clients who express a sincere desire to improve their abilities, were: 1) fish the same body of water as frequently as you can in all seasons and conditions, and 2) keep a log, diary, journal, etc. of your experiences doing #1. This will allow you to reflect back and begin drawing correlations and seeing patterns of success emerge. Our tally was 102 white bass and 1 largemouth caught today. Wind: Winds were ESE at 5-8. 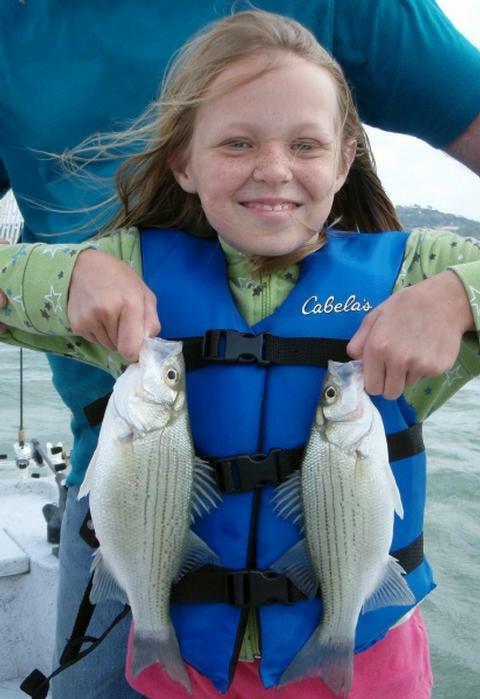 This evening we experienced the single most productive trip of the 2011 season thus far with 159 fish boated, every single one of which was a white bass. I was joined by a great crew from Rockpointe Church located in Leander, Texas. My guests were Shane M., who leads the church’s small group ministry as a volunteer, his 12 year old daughter, Grace, and the church’s senior pastor, Shayne O.
Shane M. was the “sponsor” of this adventure. 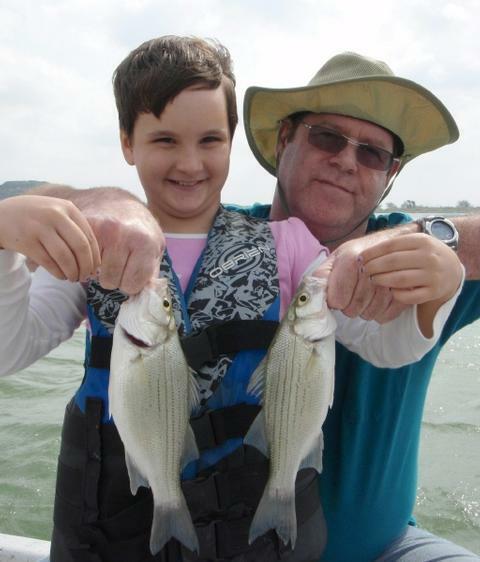 His stated goals were for his daughter to catch a lot of fish, and to give his pastor a stress break. Pastor Shayne O. of Rockpointe Church in Leander, Texas, landed the best fish of the night — a white bass just shy of 15 inches. He must be living right!! This was the group I lamented NOT having taken out on Monday (see that blog post previous to this one) when a inaccurate forecast led me to postpone their trip. Fortunately, their schedules were flexible enough to allow them to be on the water as we experienced this evening’s pre-frontal conditions with characteristic warm, stong S and SSW winds. Indeed, only hours after coming off the water, lightning began to flicker in the night sky and Bell County came under a severe thunderstorm warning as the winds turned quickly out of the north and blew hard all night. We met up around 4:15, did some dockside coaching and then began the hunt for fish. We zeroed at our first attempt. Next, we found a strong congregation of fish, although they remained relatively unresponsive (due, in part, to the fact that it was still a bit early in the evening), right at Area 757. We boated 8 fish there and then they turned off. Next we hit nearby Area 759 and experienced basically the same thing, finding good numbers of fish, but only having an initial response with no sustained action. We boated 12 here before they turned off. At what would be our next and final stop of the trip, we got right on top of Area 760. This was the shallowest of the areas I’d looked over thus far, at only 24-27 feet deep. We passed over only once, I saw what I’d hoped to see, got a buoy on the fish, and then set up over them in a hover to jig. Initially, we focused on the fish immediately beneath us using a smoking technique with TNT180 slabs in 3/4 oz. The first few fish we caught were smallish, and, I saw on sonar that fish were pursuing lures but not striking, thus leading me to downsize everyone’s baits to a 3/8 oz. profile. This definitely helped, coupled with the fact that we continued moving toward sunset with its normally increasing fish activity levels. Long story short, we sat in this one area for nearly 3 hours straight boating fish after fish after fish for a total off this area of 139 additional white bass. As is typical, a few minutes after the sunset, the bite finally died and we packed up for the ride back to the dock. Most of our fish were 1-3 year old fish, with but one anomaly — that was the largest fish of the trip taken by Shayne O. — that fish went ~14 7/8″ and just shy of 2 pounds and was likely from the year class of 2006 or earlier. Our grand total tonight was 159 fish. I was relieved that we’d had an even better day than I could have provided this great bunch of folks on this past Monday. …and Shayne, in the spirit of forgiveness, I do forgive you for turning off the trolling motor in the middle of a hot bite, and for snagging the buoy line about 3 minutes after that(LOL)!! TALLY = 159 FISH, all caught and released. Wind: Winds were SSW14 the entire trip with occasional, brief higher gusts. One thing that I try to do to enhance my clients’ chances of success is screen out non-productive weather days. When I see unfavorable wind speeds, wind directions, or frontal activity, I’ll encourage folks to postpone until things are right. 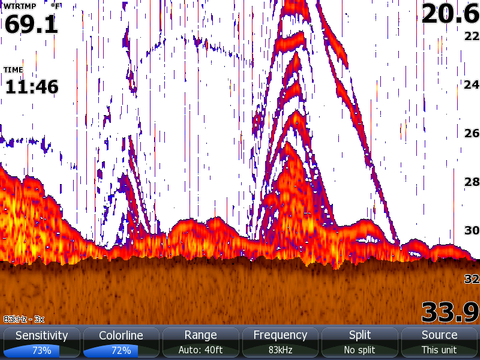 This is a sonar screen shot showing very aggressive, heavily schooled white bass on and near bottom responding well to a jigging spoon (slab). The “stacked” red marks just right of the center of the screen are fish that pursued a hooked schoolmate off the bottom as I reeled it in. So it was today — a front was due to pass overnight (which it did, with tornado warnings, severe thunderstorm warnings, and a quarter inch of rain left behind). Winds were then forecast to go nearly slack from due north. Seeing this poor weather forecast, I contacted my clients and suggested a postponement. What actually happened is that the winds began out of the west at sunrise at about 8mph, and increased slowly as they turned to the WNW, the NW, and then NNW, ramping up to 17 mph by noon. With the frontal activity (pressure increasing quickly) occuring during the daylight hours, the fish went on an aggressive feed. With no clients now lined up, I headed out by myself to look things over and at least identify some bait locations. Long story short I found not just bait, but fish ready and willing to bite … in three different areas … over a three hour span!! I found fish in 21-13 feet of water at Area 756 and boated 28 fish there. Next, at Area 723 in 31-35 feet, I found another aggressive school of fish and boated 33 fish. Finally, at Area 757 I found a setup nearly identical to that found at Area 723, and boated another 30 fish on the dot (including 1 drum and one 4 pound largemouth). Yes, I wish I’d had those clients in the boat, but, I don’t have that crystal ball I’ve been looking for in the Cabela’s catalog yet, so, better safe than sorry. Wind: Winds were W8, slowly building and turning to NNW17.